Rodney was an athlete who couldn't gain weight, and then he was a powerlifter who couldn't keep it off. See how nutrition brought balance to Rodney's life. At one point in his early 20s, Rodney Razor reached 200 pounds, but it wasn't the lean, sinuous type of weight he desired. To shed his excess fat and reach pinnacle condition, Rodney clamped down on his nutritional regimen. He finally got away from his post-workout slugfest of pizza and cheeseburgers. He started carb cycling, ate better foods across the board, and slowly worked his way into impeccable shape. Check out his nutritional regimen and see how Rodney got razor-sharp! Probably the most common misconception about physique athletes is that they work their abs more often than most people breathe. And the most common cliche in bodybuilding is that abs are made in the kitchen. Put these two conflicting statements together and you'll begin to understand why it's so hard to actually reveal that six-pack under your shirt. "People think I do abs all the time!" Rodney says. "I don't. I probably do abs a couple times per week, but I love it, because when people talk to me about my abs, it's a great transition to talk about nutrition. Abs don't come from the gym, they come from what you eat. If you want to look good, feel good, and get great results in the gym, and you want those to shine and reflect on your body, it starts with nutrition." Rodney eats very small meals these days, spaced out every 2-4 hours in a classic bodybuilding schedule. He never eats to where he is full—he keeps his metabolism churning all day. By alternating between carb depletion and carb loading, Rodney refuels his body and challenges it to adapt. The big shift for Rodney came when he started carb cycling. He does a 3:1 schedule: for three days he limits carbs from green sources like asparagus, green beans, and broccoli, and he increases his healthy fat intake (walnuts, pecans, almonds); every fourth day, Rodney adds in more sweet potatoes, brown rice, and oatmeal, with fewer fats. This helps him maintain his calorie count while giving his metabolism a boost. By alternating between carb depletion and carb loading, he refuels his body and challenges it to adapt. Rodney used to eat cheat meals for every meal, but he is wiser now. 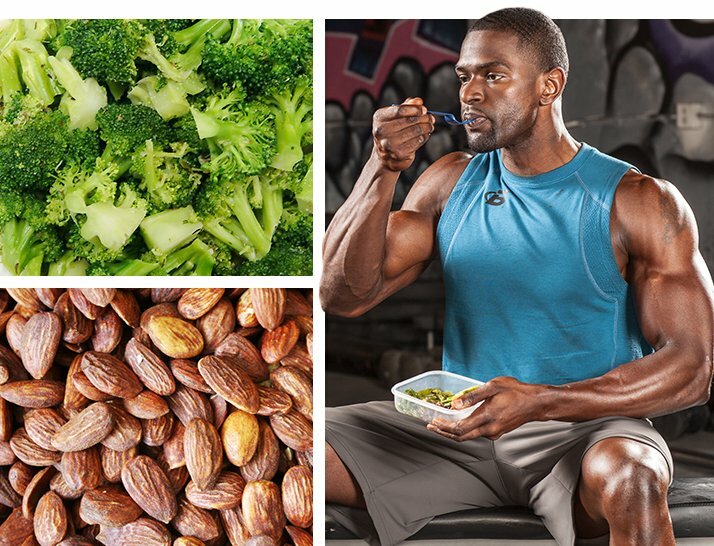 "If you're going to have a cheat meal, be conservative—once per week," Rodney says. "Use it as a treat for yourself, to celebrate all the greatness you did all week in the gym. Go have that burger then get right back to your hard work again." For Rodney, pizza and burgers are in a constant struggle to earn the top spot on his favorite foods list. But, to maintain an award-winning physique, he can't just order in. That doesn't stop Rodney from enjoying his favorites; he just eats them in healthier forms. "I enjoy pizza, awesome, but let's go home, get a wheat crust, get a low-fat cheese, [and] some healthier toppings. Take what you enjoy, re-wrap it, fit it to what you like, and you'll stick with this forever." Sample from Rodney's 3:1 carb cycle: Three low-carb days followed by one higher-carb day. *All meals seasoned with Mrs. Dash, Nu-Salt, and cayenne pepper.